Global deck machinery specialist, ACE Winches, has secured a spooling contract with Oceaneering for Shell’s Prelude Floating Liquefied Natural Gas (FLNG) project. The contract will be the first time ACE Winches’ newly developed 500te reel drive system is used. The tool is an upgrade of its existing 400-tonne system that has been engineered and manufactured at ACE Winches facilities in Aberdeenshire. The product range has been developed for high tension spooling and the deployment and recovery of subsea products such as umbilicals, risers and flow lines, flexible pipelines, power cables, telecommunication cables, tubing, wire ropes and mooring lines. It can accommodate a gross weight of 500 te. 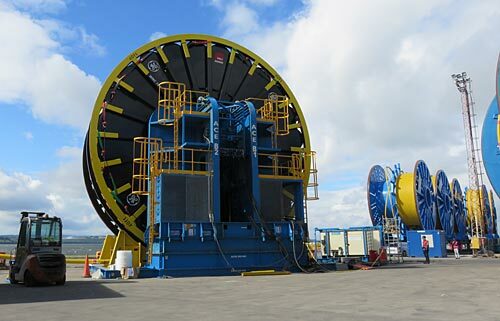 The scope of work will see ACE Winches spool 4400 metres of umbilical, with a diameter of 229 mm on to a 12.2-m reel. The weight of the umbilical is the heaviest Oceaneering has ever spooled with a total weight of 426 te. ACE Winches modified its existing 400-te reel drive system to meet the client’s specific requirements with an added base frame and packers to allow the 12.2-metre reel to be spooled on the quayside. ACE Winches also supplied a total of 10 qualified commissioning engineers and technicians to assemble the ACE 500-te reel drive system quayside, before operations started, with a further six operating technicians providing a 24 hour service to complete the first phase of spooling. The patent pending 500te system consists of two towers that disassemble into eight modules for easy transportation. The towers use a slave and master configuration, with two gear boxes in each drive hub.